A small alternator startup was about to change everything. As the aircraft population ages, their electrical systems contained outdated designs. With this in mind, Plane-Power entered with the concept to replace these antiquated designs by providing the market with modern, low cost designs based on current automotive technology, but modified to perform well in aircraft applications. 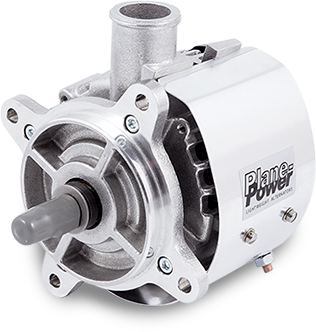 Plane-Power began developing a full line of lightweight aircraft alternator designs with mounting kits for an impressive variety of engine configurations. The line then expanded following the same philosophy to develop a simplified, common voltage regulator for those aircraft equipped with older generators and limited support. The aircraft alternator category had a viable new contender. In 2014, Hartzell Engine Technologies (HET), the category leader known for its own premium product lines, acquired Plane-Power with plans to continue the success of the line by consolidating both alternator families, and creating a powerhouse solution for the aviation industry. Leveraging HET’s historical acquisitions of Prestolite’s aviation business, Aero Electric Group, Electrosystems, and Skytronics’ Jasco line, the Plane-Power label was soon supporting OEM customer requirements with purpose-built alternators for aircraft with electrical power needs ranging from 20 to 200 amps. Today, the products continue to expand through superior design, manufacturing technology, and state-of-the-art testing facilities. The Plane-Power brand has solidified itself as the front-runner when choosing an aircraft alternator. Capable of equipping the vast majority of general aviation applications and UAVs, Plane-Power charges into the future with the goal to meet any customer’s need or budget.